At the law firm of Lawson Norris Sorensen, LLC, in Kansas City, Missouri, we provide exceptional counsel and legal assistance in all areas of family law to help you with all of the important decisions that will affect your family for years to come. Whether you have an uncontested divorce and need a reliable ally on your side during negotiations and mediation, or your case requires court intervention to resolve, you can count on us to be right there with you each step of the way to offer the practical advice and compassionate support you need as we fight hard to protect your rights and interests and help you achieve the favorable outcomes you seek. Serving clients throughout the surrounding areas of Kansas and Missouri, the attorneys at our law firm possess decades of combined legal experience, and we all work together to leverage our respective strengths in order to provide the highest level of representation possible. In addition to our legal experience, we have diverse backgrounds that enable us to connect with a broad range of clients and deliver a higher level of personalized attention to each one we serve. Divorce is never easy, but with our help, you can complete the process efficiently and move forward in your life with confidence. We also understand that you are likely concerned with what you divorce will cost, so we offer a full cost-benefit analysis right from the start so you will know what to expect. 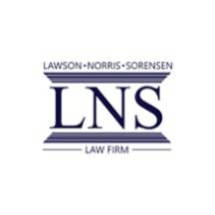 For more information on how Lawson Norris Sorensen, LLC, can best serve your needs and help you secure a brighter future for yourself and your family, please contact our law office. In addition to family law, we also handle a wide range of other legal matters, such as estate planning and traffic violation defense, so we hope you will return to us again and again for help with any other legal issues you may have.